Asha tells the “unofficial story” of the Ananda Community in Mountain View, with reduced emphasis on dates and places, and more on how the community lifts the quality of the residents’ lives. Asha: When I moved to the Bay Area in 1986, I had spent the previous sixteen years at the original Ananda community, Ananda Village, in the Sierra foothills outside Nevada City, California. I came to Ananda when I was twenty-four, so I had been involved with the community essentially for my whole adult life, and community had always seemed a natural and obvious way to live. 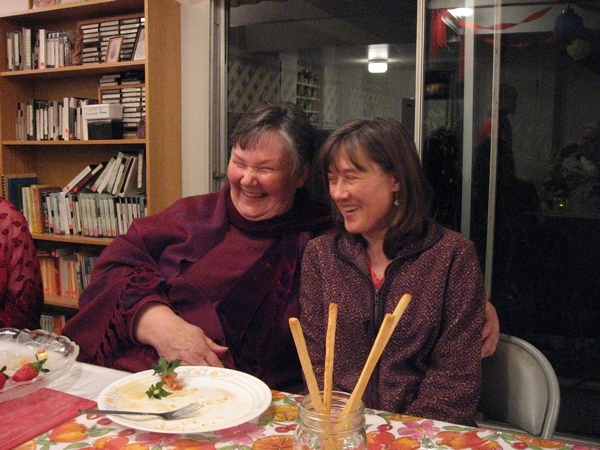 Anandaprem and Amara share a giggle at dinner in the community kitchen. At first, we moved into a big house in Atherton, where twenty-five of us lived under one roof. There were just two bathrooms and a horribly inconvenient kitchen, with a sink that was wedged into a tight corner, and a ridiculously small stove. It was an “only certain kinds of people could ever live here” environment. In fact, Swami Kriyananda suggested that my then-husband and I not live in the communal house, because if we were there full-time, we would end up spending seventy percent of our time relating to fifteen percent of the congregation. We rented a series of houses over several years, and I’ll never forget how peculiar it was for me, when the landlord’s gardener came around one day, and I looked out the window and saw a man cutting the grass whom I had never seen before. It was the first time in sixteen years when there was someone working close to my space that I didn’t know and recognize as a friend. It was an odd moment, and I realized that everything about my life had changed. It wasn’t that we were fragile flowers that would perish beyond the protective borders of the Ananda community. It was a question of suddenly seeing the difference from my own calm center, and being mildly surprised. Our ongoing perception was that living in community is a tremendous boon. And so, when it came time to find a permanent home, we looked around and realized that apartment complexes were beautifully designed to become communities, but they just weren’t being used that way. We were excited by this realization, and after living in the area for a year or so, we got together with some of our church members and started talking about community. And we were extremely underwhelmed by their enthusiasm. They weren’t interested. They were very interested in finding a better job, because most of them bitterly hated their jobs. Or they were dissatisfied with their life and looking for the answers in their work. But most had created a little nest, and they weren’t at all interested in shifting their situation. In fact, they were perceptibly afraid. You could sense that they felt they were living in a hostile world, and that it had taken enormous work to create a safe spot, and they weren’t about to sacrifice it. From our perspective, of having found great happiness living in a spiritual community, it was a very interesting situation, and it forced us to reflect on how we could convey the benefits of community life. We decided that their lack of enthusiasm was commensurate with their ignorance – they simply had not the remotest idea of what it actually means to live in a community – and therefore their resistance wasn’t something we needed to take too seriously. In this connection, I recently read that politicians nowadays adjust their policies according to the polls. The article quoted Abraham Lincoln, who used to take polls to find out what people were thinking, but then he would roll up his sleeves and get to work communicating his policies clearly, because the polls just told him that people didn’t understand those policies. So we took the Abraham Lincoln approach and decided that our job was to educate people, because their fears weren’t based on knowledge, and their lack of knowledge wasn’t serving them well, whether they might ever decide to move to the community, or not. So we worked hard to find a place for a community. And in the meantime we held a retreat to talk about the idea of community. But the only people who were genuinely enthusiastic were those who had lived at Ananda Village – in other words, the people who had actually experienced what a wonderful idea it was. The others were very cautiously interested – very cautiously. And you could see that everyone wanted to keep the back door open wide. But by this point we had reached critical mass, and we had enough people who were either courageous, foolhardy, or experienced enough to start a community. So we acquired this apartment complex and began moving in. We knew that we needed to move in with enough people to create a critical mass, because with just a few there wouldn’t be the right spirit, or enough of it. But we couldn’t expect everyone to join us right away, so we went forward in the knowledge that we had barely enough people to pull it off. But, as we got closer to the big move-in, the general enthusiasm and excitement rose to a point where a family sold their house and came along, purely because they felt they couldn’t bear to have it happen without them. So we got it going, and as soon as it started the people who were living here realized that, far from being a terrible threat to their security and privacy, it was the greatest gift they could have given themselves for their sense of security. We are all under so much stress, because we are constantly surrounded by strangers in this culture, and they are very often dissonant with our beliefs, or they may even be hostile, and people have no concept of how much psychic energy they have to expend to shield themselves from these influences. Whereas, living in a community, you may hardly talk to the people next door, yet knowing that they are harmonious with your values and ideals allows a certain level of relaxation. We’re by no means communal in the Ananda Community. And because the community is based on gradually exploring the joys of voluntary sharing, nobody’s fears materialized. After our first Thanksgiving celebration, one of the residents went back to work and told everyone that he’d had ninety of his best friends over for Thanksgiving dinner. It was such an amusing statement that he went around repeating it over and over. And, of course, after my many years of living in community, my concept was that if you had just ninety, it was a pretty small party! But for him to be able to say he had ninety “best friends” was shocking to his co-workers. But what was most shocking to them was that he absolutely meant it. At the same time, they recognized that it was the most natural lifestyle they’d ever encountered. What’s happened in the last hundred years in this country is that we’ve fragmented our culture to the point where people feel that they don’t belong anywhere. They aren’t living with their families, they aren’t living where they grew up, and all of their relationships are secondary. Whereas you come here, and you suddenly form many relationships, without intruding on the smaller circle of friends that you might naturally wish to surround yourself with, with whom you have a natural affinity. Q: This community doesn’t aim to re-create the idyll of the American small town, does it? Are people closer here because they’ve chosen their friends? Asha: Oh, yes – Swami Kriyananda wrote that the difficulty with small towns is that – with all due respect – they can be very petty, narrow-minded, and mean-spirited. People think about them in idyllic terms, but they’re often just hotbeds of gossip and backbiting. What to speak of the fact that if you’re at all eccentric, they can be utterly hostile. Smallness can be stunting, whereas in an intentional community you end up with a small group of highly pre-sorted individuals who are on the same basic wavelength, and that wavelength is yours. Q: In an intentional community, you can still find cranks and gossips, can’t you? But if you’ve selected for people who are basically expansive and good-hearted, does it form a larger wave that nullifies those negative vibrations? Asha: The others are grist for the mill. St. Therese of Lisieux told her nuns that if they didn’t have people in the monastery who upset them, it would behoove them to go out and find them, so that they could have something to chafe against and grow. Let’s just say that in the Ananda communities we’ve never had to go out and find them. (laughs) God has always done a pretty good job of sending them our way. The real problem isn’t that some people are difficult, because really it’s entirely a matter of intention. You don’t have to be a saint to live in a cooperative community. You don’t even have to be a mildly good person. You just have to be trying to be one. We believe that you have to be facing in the right direction, but you don’t have to have reached the goal. If those people are sincerely intentioned, then they’re just grist for the mill. But if they’re genuinely discordant, well, it’s a big world, and there’s another place for them. Q: Do they tend to fall out naturally? Asha: They do tend to fall out, because nothing is happening here that they can enjoy. If they want an emotionally chaotic life where egos are constantly butting against each other, they find that in the community they’re battling with a pillow. So it’s been self-selecting. And there’s a margin of comfort in a community such as this, because there are enough apartments that people can hang around without participating, without disturbing the essential vibration that we’ve created. They drive in and out as if they were renters, and it’s not a problem. But over the years we’ve kept way above critical mass with positive, kind and compassionate people, and the few who’ve tended to pull the energy down have moved away. Q: Do people go through a period of adjustment when they move into the community? Asha: It depends on their circumstances. If they come here as well-adjusted, happy people who are opting for something better, the adjustment period is usually zero. They may be in a difficult transition, because people will often move when something has fallen apart in their lives. If they’re coming in as the “walking wounded,” or they’re working out a grief, the transition can be more difficult. If people have deep-seated fears of interacting with others, or big authority issues, they can project those onto the scene, and it may take a while before they wake up and realize where they are. Sometimes it takes a month, sometimes it can take years, but they eventually realize that they’re the ones banging on the pots and making all the noise about oppression and invasion and so forth. Or it comes to a happy conclusion because they’ve decided that this isn’t where they belong. The transition is sometimes purely mechanical, in the sense that our apartments are small, the walls are relatively thin, and the traffic noises can be disruptive. Depending on where you lived before, the small things can be disconcerting, but they’re more circumstantial than community-oriented. And the minor inconveniences are usually balanced by the fun of living in the community – the community dinners with friendly conversations and lots of laughter, the morning meditations, the service to others, social gatherings around the swimming pool, working in the garden, etc. Q: There’s a thought in people’s minds that living in a separate community implies that you’re closing yourself off from the wide community at large, that you’re forsaking your social responsibilities or trying to be better than others. But is it even possible, in a community that’s surrounded by Silicon Valley, to close yourself off from the life that’s swirling around you? Asha: Here in Mountain View, in fact, the “outside world” is just inches away. But it’s a concern that people have, that you might lose the capacity to relate, or that you might become a delicate hothouse plant, or too dependent on the community. Those are real questions, and the short answer is “No, it’s not a problem.” It’s not a problem because there’s nothing about the life we lead that encourages you to enter an unreal world or cut yourself off from society. Now, that doesn’t mean we think it’s real important to be able to discuss the most current TV shows and know the lyrics to all the popular songs. The majority of us have drawn lines that we would probably draw even if we lived outside of the community. We feel little need to be up on all the current celebrity gossip, and we’ve independently decided that a lot of what people are interested in isn’t worth our time. In that sense, we do live a little apart from society, but it’s a personal choice based on our spiritual values and on analyzing what we think is a waste of time or worse. Collectively, we support each other in that. You can live and be active here, and no one will know that you didn’t see the last episode of the latest hot sitcom. It won’t matter, and it will never come up. But what people are really wondering when they ask those questions is: are we able to cope with people and environments different than our own? And that’s another serious question. But, really, what gives us the capacity to cope? Is it being so adjusted to the crowd that we can swim along without being noticed? Or is it developing the inner strength to discern the best choices among our options and act on them. Standing back a little from the crowd and thinking for ourselves, far from weakening our ability to relate, strengthens it enormously. Because whatever comes, we’re able to relate to it from a level of inner strength, rather than just weakly reacting like a leaf being blown about by the wind. Living in harmony with people who share our ideals and support us in our inner development makes us stronger, not weaker. For us, it’s a no-brainer, but it does sound rather unorthodox, so these questions have to be asked and answered, over and over. Q: The Ananda Community has major interfaces with the community at large, not only through the church, Ananda Sangha, but also a very popular Ananda-owned store in downtown Mountain View, East West Bookshop. Asha: Some of the people who live here work for an Ananda business or at the Sangha, and all of those Ananda enterprises interact with the public. In fact, East West Bookshop is a far more interactive place to work than most people’s jobs, if they’re just commuting to a cubicle and writing code or pushing paper all day. Retail businesses are interactive by nature, and we also run a school that is extremely interactive with parents, other schools, and the culture at large. And of course the Sangha serves the general public. Q: The people who work at the front desk at East West have remarked that they feel a greater degree of interaction with the public than when they’ve worked in other retail businesses, because they’re consciously trying to relate to the customers as friends, rather than just sell them goods. Asha: It’s true. And the fact that we have ninety close friends in the community forces us to interact much more frequently with “the world,” so to speak, than most people who don’t even know their neighbors. Moreover, the majority who live here and have “regular” non-Ananda jobs go out every morning and spend all day interacting with others. So the idea that we’re somehow isolated from reality or the wider society is a complete myth. We’re living a normal life, except that we get to come home to a wonderful place at the end of the day. Are you seeking inner peace? Looking for purpose and meaning? Wanting a deeper connection with the Divine? For more than forty years, Ananda has helped many in the Bay Area to satisfy their longing for a spiritually fulfilled life. Regardless of your path, we offer support and friendship for your journey. Visit the website of Ananda Palo Alto. The Living Wisdom Schools offer a balanced education that includes both head and heart. Our proven Education for Life learning environment nurtures happy children who excel in school and life. Visit the website of Living Wisdom School. Ananda is based on the teachings of Paramhansa Yogananda. To learn more, visit the website of Ananda Sangha at the original Ananda community in the foothills of the Sierra Nevada, near Nevada City, California.